No Regrets championed triumphantly over Jesse Rooke’s KTM on the race challenge set in place by the producers of Discovery Channel’s Biker Build Off and left with the trophy, bragging rights, and in cloud of smoke from a Sands burnout. No Regrets was built in a grueling two weeks at the RSD shop and features many one-off prototype designs by RSD and Sand’s traditional style of Öhlins racing forks, Performance Machine contour controls and brakes, Dunlop racing tires, and the RSD Nostalgia cover line. 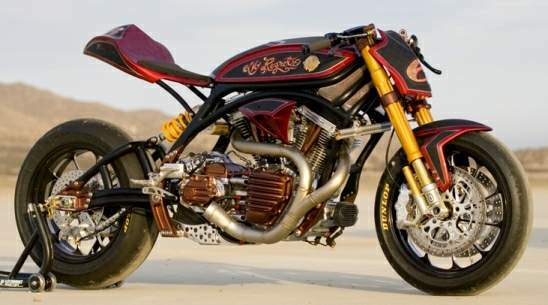 The bike’s name was inspired by Sands’ friend, the late Johnny “Chop” Vasko who was scheduled to work on the project, but tragically passed away days before.